Wrexham have re-signed former trainee Kai Edwards on a one-year deal after the defender was released by Welsh treble winners The New Saints. Edwards is Wrexham manager Gary Mills' first signing of the summer. The centre-half made two first team appearances for Wrexham before leaving the Dragons during the summer of 2011. 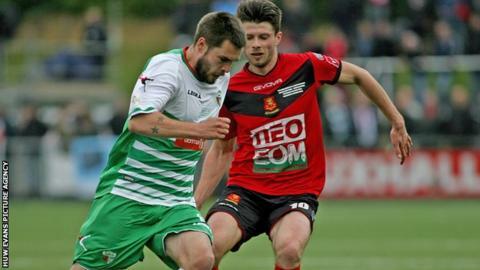 The 25-year-old spent a season with Neath but joined New Saints in 2012 following the club's liquidation. He has represented Wales at Under 17 and Under 19 level as well as the Wales Under 23 semi-professional side.